Google's end run around Apple's App Store is complete: Google Voice is ready as a Web application. Owners of the iPhone and Palm's WebOS devices can now get in on the mobile Google Voice experience with the Web app, which will run in the browsers of iPhones with the 3.0 software installed and all Palm WebOS devices, said Vincent Paquet, senior product manager at Google. The application should be available for current users of Google Voice--which is still an invitation-only service--as of Tuesday at m.google.com/voice. Google Voice allows incoming calls to ring mobile phones, office phones, or desk phones depending on how the user sets their Google Voice profile. It also treats voice mail like e-mail, transcribing voice messages into an in-box where they can be read and deleted. 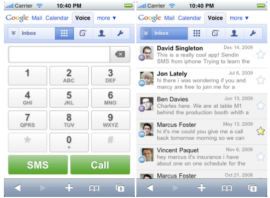 Last year Google submitted a native version of Google Voice to Apple in hopes of getting the software onto the iPhone. As most will recall, Apple and Google then entered into a semantic war of words over whether Apple rejected the application (Google's version) or merely continues to study it (Apple's version). Either way, the FCC got involved and Google Voice remains in App Store limbo, Paquet said. "We haven't had any updates regarding our native app for the iPhone, unfortunately," Paquet said. However, now that the Web app is ready iPhone users will be able to get essentially the same experience that the native app would have delivered, although the user interface will be slightly different because the application will be running in the browser. Paquet declined to comment on whether Google plans to continue the App Store approval process with the native version. The Web application is another sign of Google's strong desire to encourage people to think of Web-based applications as a ready alternative to native applications. The company has spoken about its plans for Web development at length, and even plans to develop a lightweight operating system based on its Chrome browser as a sort of proof-of-concept for the Web development mindset.